Off we ventured this weekend to our favorite tree farm in North Georgia in our hunt for the 2010 family Christmas tree. From the tractor ride out to the fields, to the hide and seek games among the trees and the roasted marshmallows afterward it was yet again, a fun-filled day. I’m a sucker for tradition and got sentimental as I saw that my favorite tree on the farm, pictured last year in my Tree Hunt Beauty post, was still standing. Maybe not a beauty in most eyes, but definitely a beauty in mine. I simply love this tree. I’d imagine that prior to its demise from a lightning strike and fire, it bore an enormous canopy and had great presence next to the water and rows of growing trees. 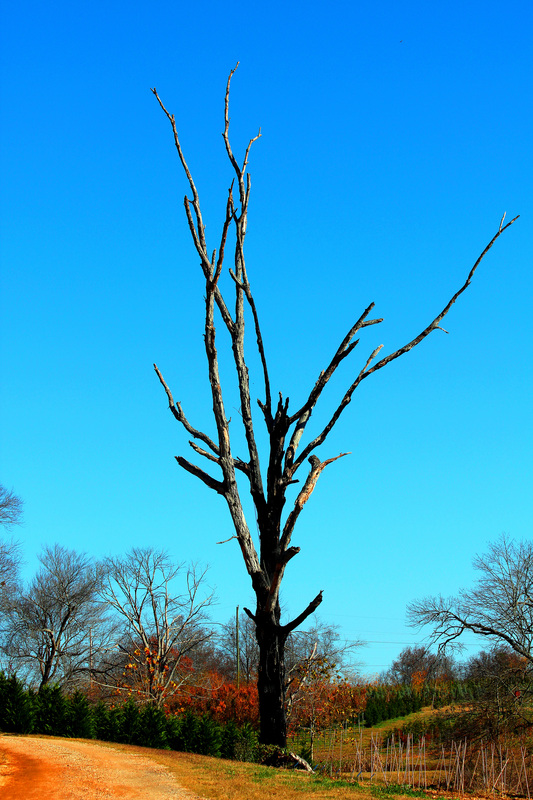 While its limbs are stark, black and bare now, it maintains a great spirit in the field and for that, I love it. Paul pointed it out to the boys on our tractor ride and called it “Mommy’s Tree” since he knows how much I admire it and in keeping with last year, I had to capture a photos of it too. love how the 2 pictures have absolutely perfect skies!